This past week I watched both Rocky Balboa and 300. Long ago, I learned to just watch movies for pure entertainment and then deconstruct them for fun afterwards. I enjoyed both these movies for the choreography of the fight scenes, as well as the guilty pleasure of watching eye candy cinematography (in the case of ‘300’) and reliving childhood nostalgia (in the case of ‘Rocky Balboa’). And it struck me how both films follow the same narrative. What could possibly be similar about these two very different movies, set thousands of years apart. One movie is about a Spartan king, who against overwhelming odds, and against the wishes of his council, takes a small contingent of warriors who embody old school values of toughness and discipline, and valiantly fends off the superior forces of the Persian Empire, led by an arrogant Xerxes. The other movie is about a former heavyweight champion boxer who, at nearly 60 years old, decides to go toe to toe with the current heavyweight champion, despite all his friends and family advising him against it. And though in the end he loses, he valiantly defies overwhelming odds to give a tough fight, humbling the bigger, stronger opponent, proving that old school values triumph over the flashier newer model. Each based its premise on an underdog facing a vastly superior opponent. ‘300’ claims that only 300 Spartans and some other Greeks fought against an army of one million, while an arthritic Rocky, after decades of retirement, and no recent fights, boxes against a younger, faster, taller and bigger undefeated opponent. Both underdogs are noble white men, one a king, one a former champion. The underdog embodies values such as hard work, discpline, honor, and an unwillingness to retreat or surrender. 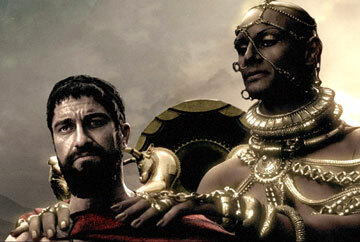 The narrative in ‘300’ portrays the Spartans as protectors of democratic values and freedom. Although, fewer than 30% of Spartans were free. The rest were slaves. Neither was Sparta a democracy, as embodied by Leonidas, who was a king. The Spartans were ruled by two kings in fact, and didn’t provide much freedom for the numerous babies that were victims of infanticide. Both films feature a bad guy that is big, black and arrogant, gaudily displaying wealth, and undone by hubris. Neither believe that the underdog has a chance. 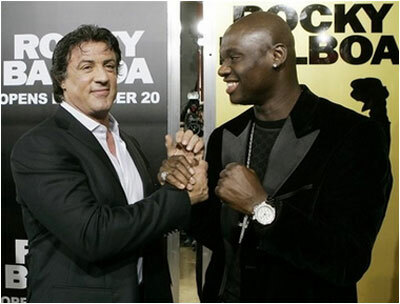 In fact, there is a scene in both movies in which they try to cut a deal with Rocky/Leonidas so that they might be able to save face. They badly underestimate them. Then when the underdogs prove their mettle, the bad guys come out in full force, Mason Dixon pounding Rocky, while Xerxes sends in his best, the Immortals. While the underdogs achieve a moral victory, in the end they relent to the superior opponent. The endings are a bit dissimilar in that Xerxes, is more shocked than humbled by his defeats, surprised that his divinity couldn’t protect him from being wounded by Leonidas’ spear. Mason Dixon, on the other hand, learns to respect Rocky, humbled by what it really takes to be a champion. The grizzled veteran passed on his knowledge to the next generation of boxers. Films have so often reflected the times in which they were released, I pondered what the narratives were representing in the real world. In ‘300’ the message is clear: the brave militaristic Spartans must protect the center of Western Civilization against the despotic, superstitious hordes of the Middle East. The hordes were unquestionably Asian and African, their otherness emphasized by their silver masks, scarred and deformed faces, monsters, piercings, exotic weapons and over-the-top haughtiness. The Spartans were sparsely adorned, fighting honestly with minimal clothes, a spear, a sword and a shield. They wore dramatic red capes which the real Spartans didn’t wear. Actually, the real Spartans fought naked. There was no empathy for any of the soldiers of the Persian Empire. Mason Dixon, on the other hand, credibly played by real life boxer Antonio Carver, was humanized and provided an alternative vision of the enemy transformed. Though he is the other, we felt empathy for his very ordinary need to be admired and respected, which he achieved by fighting with ‘heart’. Only by fighting within the confines of traditional expectations, taught to him by the establishment, in this case an established and beloved fighter, can he truly be recognized as a real fighter. Both these movies might be allegories of the US taming and humbling an inscrutable Islamic horde. But I suspect the narrative may be interpreted in quite a different way by some, with the US as the overwhelmingly superior power, on its way to be humbled by a smaller but more righteous force. Either way, we need to create completely new narratives in which we develop mutual respect without having to come to blows. Didnt know the forum rules allowed such billriant posts.